Texture is set to be a big interior trend in 2019. We’ve seen texture used more and more in recent years, with interior designers adding depth and dimension to rooms by cleverly combining contrasting velvets, satins, metallics and more. As the trend has grown and expanded from soft furnishings and fittings to wall and floor coverings, the popularity of textured tiles has increased hugely. 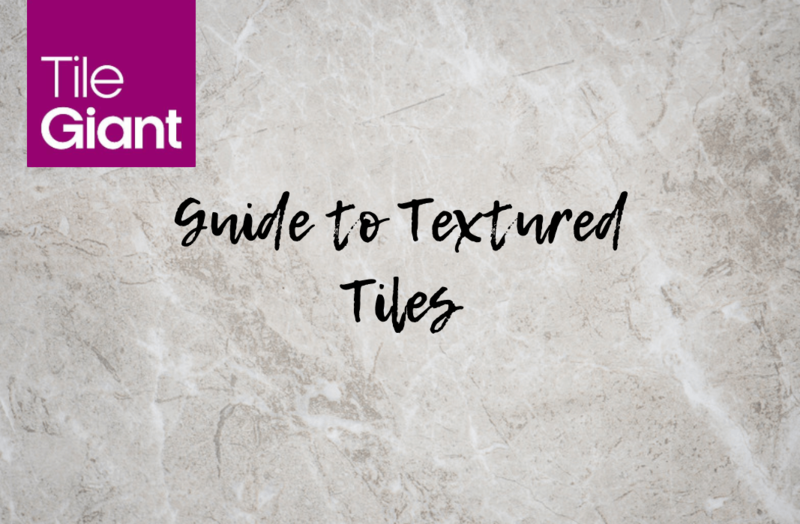 Our complete guide to textured tiles will take you through everything you need to know. From choosing the right textured tiles for your home, keeping them looking great and styling them effectively. But first, let's look at the benefits of textured tiles and what makes them unique. The main characteristic of textured tiles is that they are not smooth or flat to touch. Their surfaces have tactile and 3D qualities which effortlessly add interest and dimension to your home. The shapes and patterns found within textured tiles can help create a sense of movement when applied to the walls of your home. Their raised or embossed surfaces are perfect for adding a bit of textural nuance to any neutral setting, without being overwhelming. They are the ideal choice if you want to make a subtle statement. As well as the typical characteristics of textured tiles being aesthetically pleasing, they also make them a practical choice. The typically raised texture of these tiles gives them non-slip properties, making them an ideal choice for bathrooms and kitchens. Another benefit of textured tiles is that they can make your room look bigger. Using structured linear or wave designs in your tiles can help to elongate your room, drawing the eye horizontally - perfect for giving a small bathroom a larger than life feel. The variety of textured tiles available is ever growing. With new styles being created all the time, you’re sure to find something that suits your style and home. 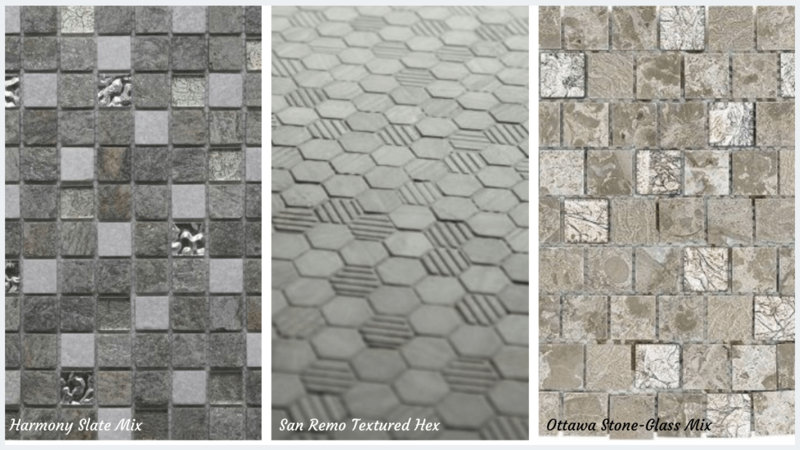 From waves and structured linear designs to intricate geometric shapes and natural stone effects, there are so many different types of textured tile to choose from. Textured tiles have been evolving for a while and so there are now many variations and styles to choose from. No matter your interior style preferences, you’re sure to find a design you love. One of the most popular tile textures is the wave. 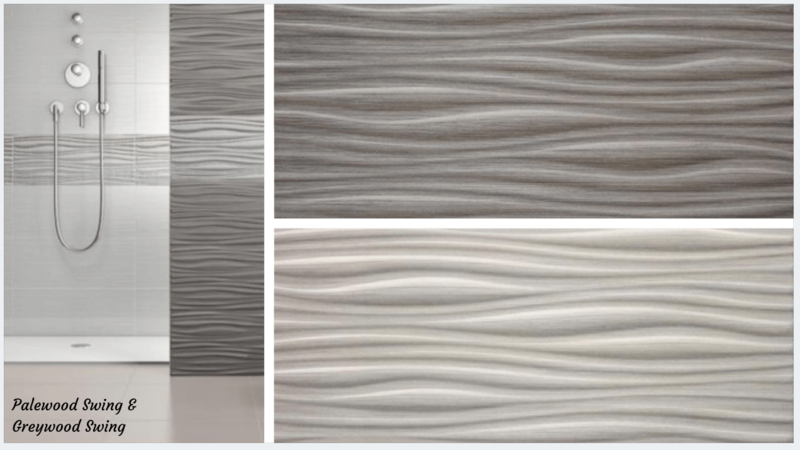 The soft raised wave designs mimicking ocean waves can give a calming effect, perfect for a bathroom. However, this design is very versatile allowing you to add an area of interest in any room. Linear or brush stroke tiles are also popular but give a more modern and clean feel. The neat horizontal lines repeated across the surface can help to elongate your room and make it seem bigger than it is. Mosaics come in so many variations, from dark and dramatic to natural and minimalist, so there’s something for all types of home. Use them subtly to add an area of interest or create a statement with tiny tiles. The combination of the small tiles with different shapes and a mixture of finishes like glass and natural stone create an overall textured effect. Wood effect tiles proved popular during 2018 and their popularity is likely to continue into 2019. They’re versatile for use in any room and available in a variety of colour tones and textures to match your existing decor. The wood effect is deeply embedded into the tile surface, giving a realistic and convincing texture of the real thing whilst being far easier to maintain. 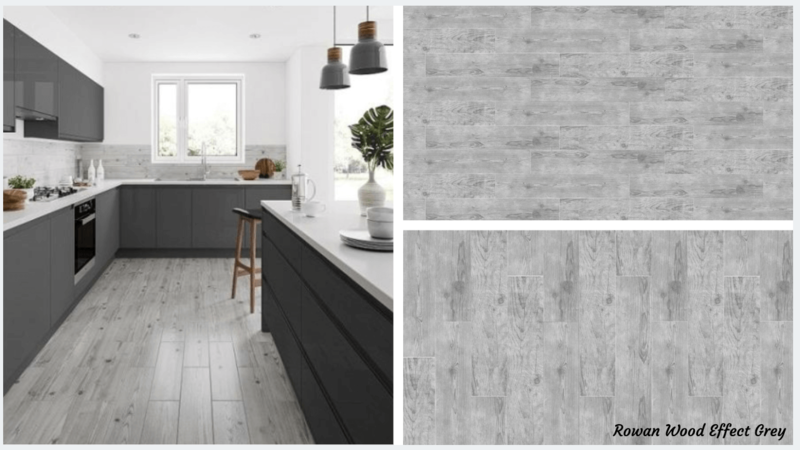 If you're after a more delicate look, Rowan provides a more subtle texture that will allow you to get a wood effect feel without the harsher appearance of some of the deeper ridged tiles. There are a few things to take into consideration when choosing your new textured wall or floor tiles. Firstly, the tiles need to be right for the room and its purpose. If you’re tiling a bathroom or kitchen, you’ll want to make sure that the tiles give a good amount of slip resistance and that they’re easy to clean. By their nature, most textured floor tiles add grip giving them non-slip properties, so they’re not only great to look at but practical too. Next, you’ll want to think about the look and feel you like in your interior style as this will inform the type of texture you choose. If your home style is quite modern and minimalistic, the linear or brush stroke style tiles are a perfect fit, with their clean lines. If you prefer a more rustic or traditional feel in your home, the natural look of wood effect tiles might be the way to go. The size of your room is also something you should consider. If you’re decorating a small bathroom, using lots of small mosaic tiles could make the room feel overwhelming and cluttered. Instead, use larger rectangular tiles to expand and lengthen the wall space and make your room seem bigger. A larger space is the perfect place to make a statement with mosaic tiles, without the decor feeling too busy for the room. With their grey speckled stone effect design, the new range of Trinity textured wall tiles are perfect for giving your home a contemporary edge. The 25x60cm rectangular format tiles are perfect for use in kitchens as well as bathrooms and are great for making the most of a small space. There are two tile designs within the range; the Trinity Light Grey Architect tile and the Trinity Light Grey tile. The light grey architect tile features a raised 3D wave design and the light grey tile is a plain grey stone effect tile. 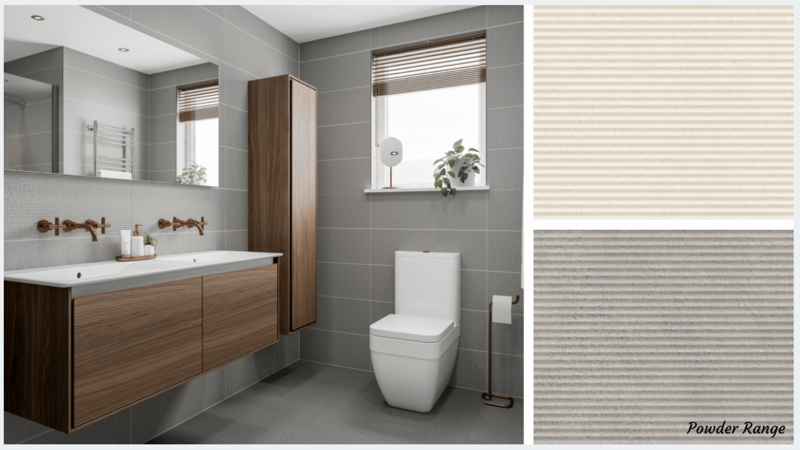 Trinity lends itself well for use in a modern and contemporary bathroom. By combining the two tiles in the range, texture and dimension are added to the room in a more subtle yet still modern way. The waves weaving across the surface give a tactile, 3d effect which can be enhanced by clever use of lighting. We love the effect created by combining the Trinity Architect tiles with the modern light fixtures. Carrying on the sophisticated black, white and grey colour scheme with sleek contemporary bathroom furniture in matching tones. Add a pop of colour to an otherwise monochrome room using plants, towels and a brightly patterned blind. We offer extremely competitive pricing on our entire range of tiles and our new Trinity range of tiles are competitive for retail and trade. Our stock is widely available in our 90+ showrooms which are open to browse at your leisure.